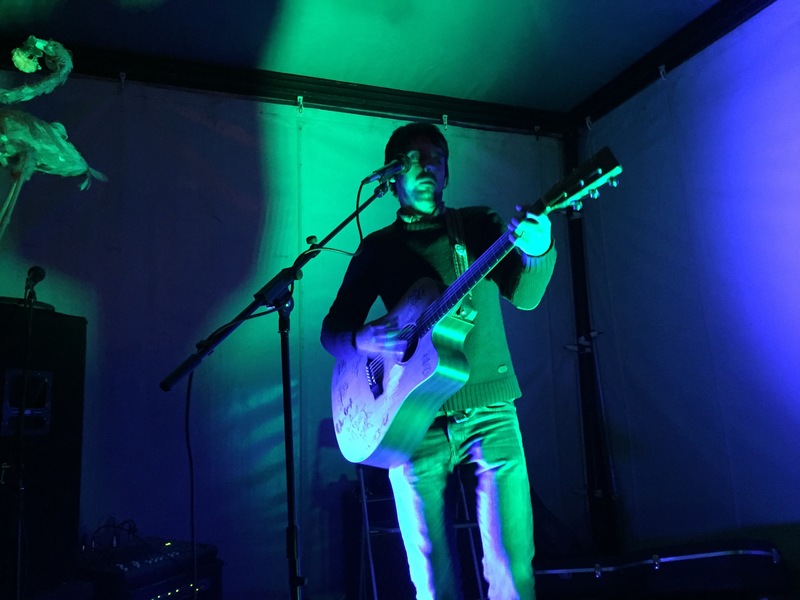 Then the rain came – we retreated vanward for a while, in the meantime the acoustic music had started on the second stage in the arena, we caught waves of a man singing a song about the perils of sticking your finger up your nose… and in other places! I’m guessing that it was Baxter from the programme notes, but there were definitely more acts on Friday than the programme suggests so who knows?! By the time we braved the outdoors once the rain subsided we’d had a chance to properly catch up with folk like Paul, Jayne and Jamie camped nearby and get ready for the music to start for us. 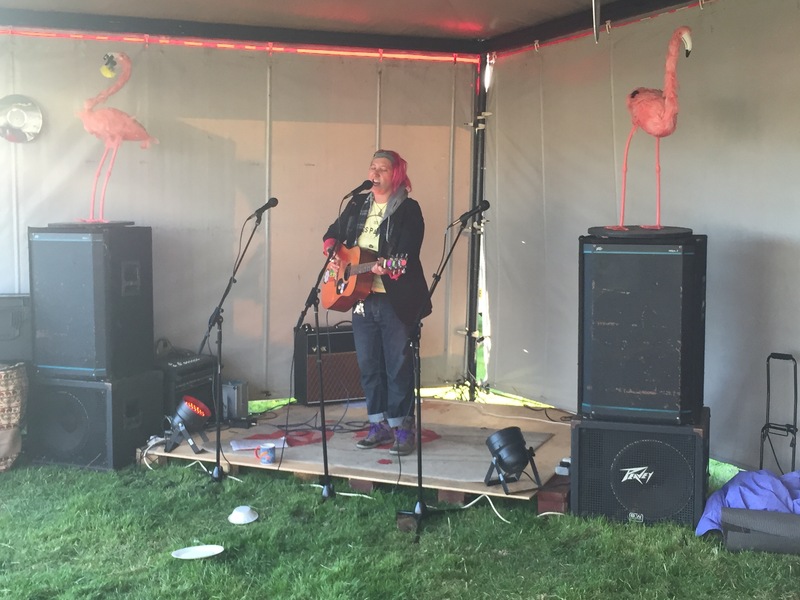 The acoustic stage was a pallet stage nestled in a big dual gazebo structure bedecked with record decorations, a mantlepiece and a three piece suit as well as chairs – and a couple of flamingos sat on top of the speakers. I was definitely going to like it here! Helen on Earth took the stage with her guitar and entertained us with an ace set – stand-out tracks for me were an eclectic selection of genres like Missing by Everything But the Girl, Young Revolutionaries by Big Mountain, Peace Train by Bob Marley and I Won’t Go Round by Saturday night’s headliners Tarantism. 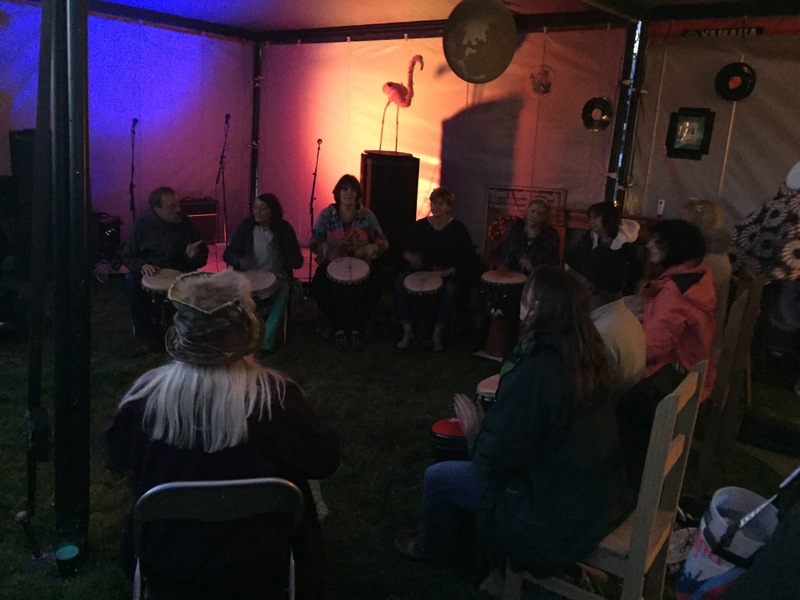 Really lovely feel good set – Helen would go on to be compere for the rest of the weekend. We had a chance to catch up with more folk – Nana’s Kitchen was in the house to provide sustenance (in the form of tea and coffee for us initially – we’re so rock and roll! 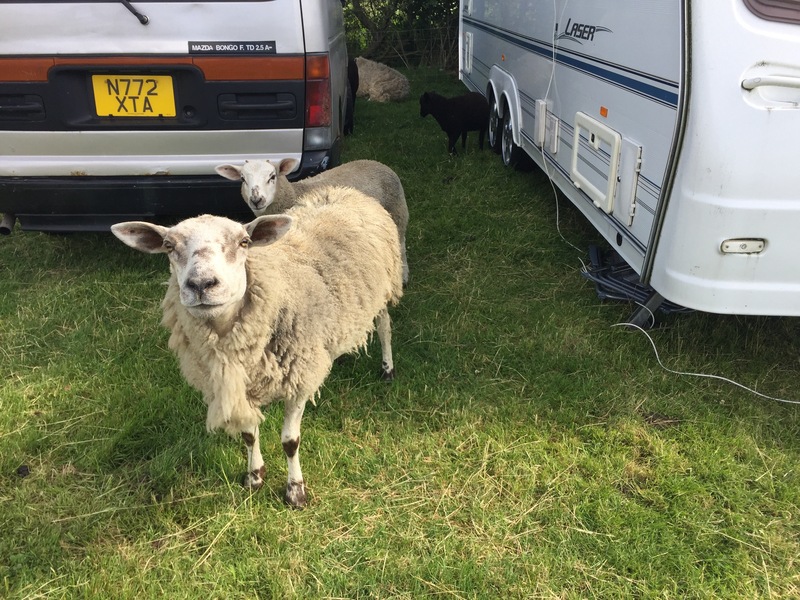 ), but great to catch up with the awesome crew who work there, Brian had appeared from whereever he’d been too, and after hiding in his car during the rain before putting his tent up we also found Addie, Rob and family – it was shaping up to be a fun party! The aforementioned Brian Stone was up on stage next for us (I think we managed to miss another act – not a great start on the seeing acts front, is it?). We watched with a healthy crowd – including Karen and Alex providing familial support. Brian kicked off with Leatherat’s Life in this Old Dog Yet, then his own Life Begins @ 50 and then a rousing singalong (and dance routine from Ella and Karen!) for Ward the Pirate. Quiet Anarchist saw the unveiling of the flag Dave E had made for Brian in response to the song, a touching tribute to his Dad’s understated rebelliousness, and then on to Barrow Downs and Why Is All The Rum Gone including a hip flask of rum to be handed around the crowd (I’d got some honey rum too to share ,so it was certainly rum-tastic!). Next up was a new song, which clearly has a moving back story and inspired by Brian’s mum, called Did She Know – according to Facebook a video will be released soon. It was quite moving even without knowing the back story. To lift the mood he played a lovely acoustic cover of Ferocious Dog’s Quiet Paddy (including some sublime finger-picking of Dan’s fiddle intro to get it started!). Then another new (to me at least) song called Why Do You Care – a lambast at judgemental folk who put too much stock in their preconceived notions of people’s appearance. Finally he finished up a longer-than-planned set with a cover of Levellers classic The Boatman. Next up was a mass gathering of bongo players beating out a rhythmic treat for the assembled crowd before another performer got up with a guitar to run through a set of fun singalong covers – Oasis’ Cast No Shadow, Kate Bush’s Hounds of Love and a nice version of Bob Marley’s Redemption Song stood out – by this point I’d had a few ciders and was nattering so I never did find out who he was which I’m terribly sorry about, he was really good though! 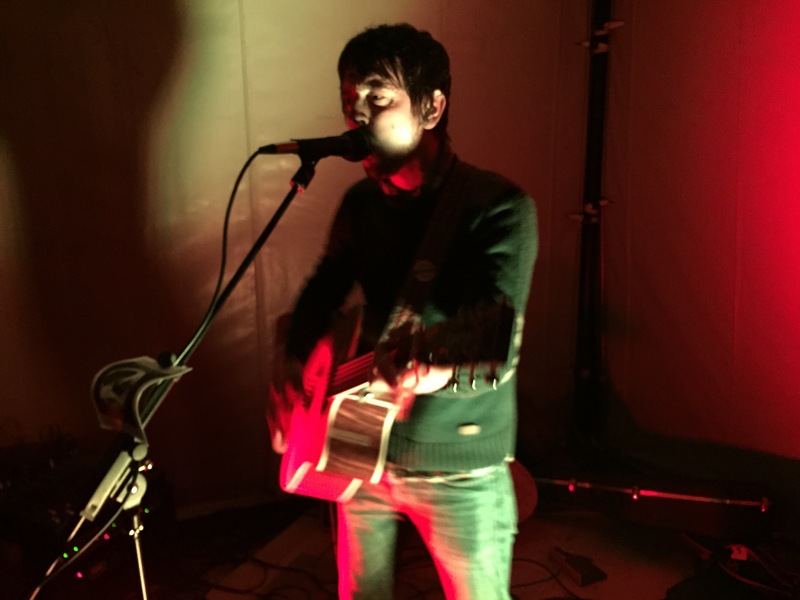 The very familiar Maelor Hughes was up next though – I’d jokingly said to him before he went on that it must be a bit nerve-racking to follow someone who’d played loads of really popular cover versions then go and play your own stuff. What an insensitive thing to say! I’m not sure if that inspired a slightly-more-covers-than-normal set from him, but it worked really well for me – a really fun set, comprising of about two-thirds his own stuff (which I’m glad about!). He started with James’ Laid – but any nervousness around playing his own songs must’ve been quickly quelled when folk were singing the chorus of Big Golden Pot back with a fair degree of ferocity with no prompting! Better Day morphed into a reworking of Gaz Brookfield’s Let The East Winds Blow (Let The North Winds Blow – although y’know, meteorologically speaking if he let the North winds blow they’d take him down south – ha!). The Jam’s Town Called Malice got an airing next much to Ella’s delight, then Transvestite Blues during which he amusing snapped his g-string. Fnar! He powered through a cover of The Wonderstuff’s Size of a Cow whilst Brian helpfully popped to fetch his guitar, before launching into Milltown Boy (with bellows from Jamie between every song demanding he play songs he knows (ie, his own songs rather than covers). This led to a definitely post-watershed song about Jamie which I couldn’t possibly repeat here! Fight For You led into a cover of Levellers’ The Boatman (including the Spaceman re-written version of legend), then the-song-what-he-wrote-after-talking-with-a-hippy-in-the-Netherlands-that-I’ve-forgotten-the-title-of. 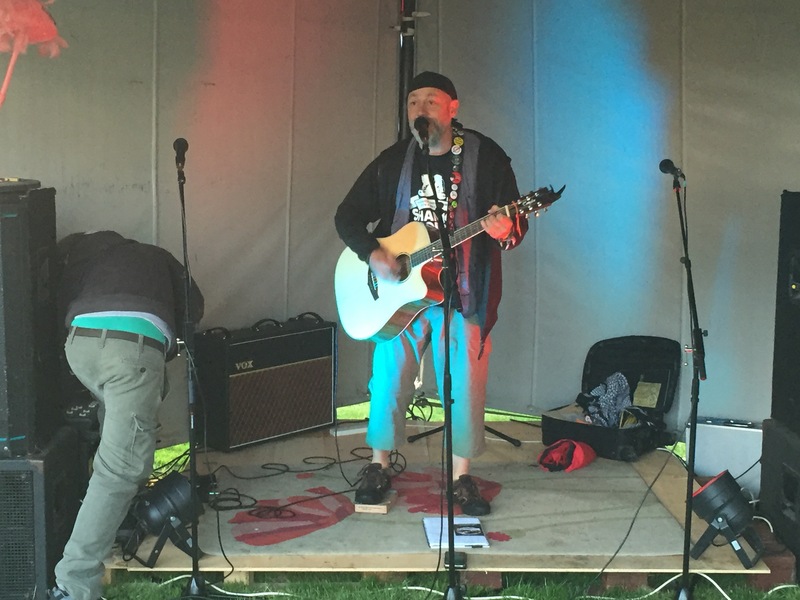 He treated us to his slow finger-picky intro version of Levellers anthem One Way and finished up with the lovely Morning Sun – I noticed something for the first time that he pops his plectrum in his mouth, like in his mouth whilst singing it! Not bad for a cider addled so and so.